Release party is from 8-10pm on November 3rd, at the Member Company Forum on SCS. The November Guest Designer Contest continues and ends on Tuesday, November 2nd at 10 PM EST. The winner will be announced at the release party. Get the deets here. 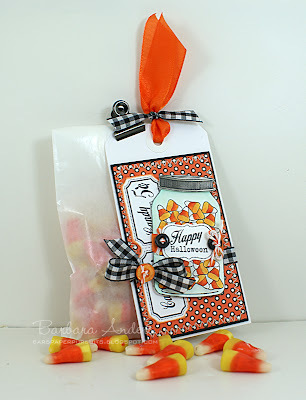 The November Hop and Shop will begin at 10:00pm November 3rd, with the hop starting at Kim's Blog. 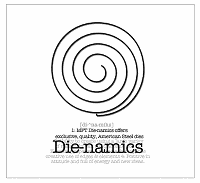 Any excuse to use a Die-namics Frame is good enough for me. 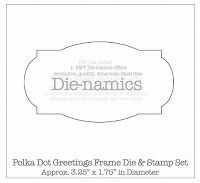 First I stamped the Polka Dot Greetings Frame image, then the sentiment from Happy Thoughts, then cut it out with the Polka Dot Frame Die-namics die and popped it up over the black ribbon. 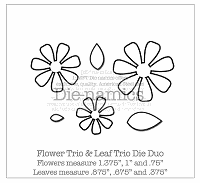 Last, I added a flower and leaves to the bow using the Rolled Flower Die-namics die and the leaves from the Flower Trio and Leaf Trio Die-namics. A really simple layout, highlighting that fabulous sentiment. 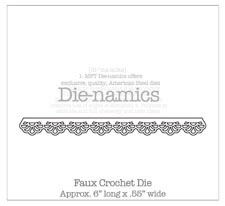 And there's the inside, using another sentiment from the set and a brand new Die-namics die--the Faux Crochet die. Ain't it purty!? 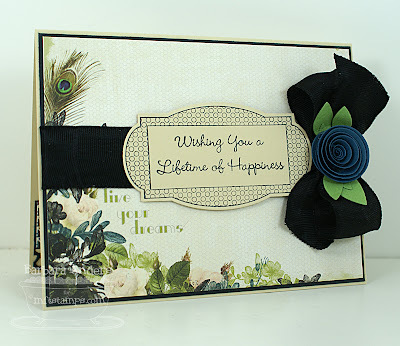 I just love this border die--so elegant! Thanks for stopping by! Tomorrow is Monday--you know that means some Pure Innocence cuteness! The November Guest Designer Contest begins today and ends on Tuesday, November 2nd at 10 PM EST. The winner will be announced at the release party. Get the deets here. OK, now for my card showing these CUTE new sets. Look at Wyatt in his snow suit playing with his snowy friend! Is that not adorable!? 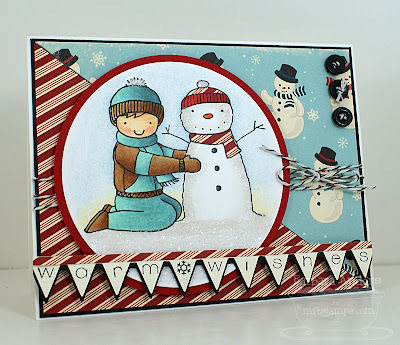 I stamped the image on a Perfect Paper Panel with Memento Tuxedo Black ink and colored it with Copic markers--the snowman's hat and scarf are paper pieced, then I added some Glitzy Glitter to the two hat pom-poms, the snowman, and the ground. 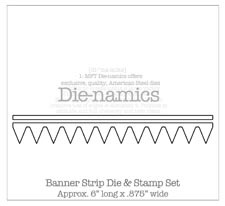 The banner was cut out twice with the new Mini Banner Day Die-namics die and matted, with the candy cane strip from patterned paper added on top, then popped up with Pop Dots. 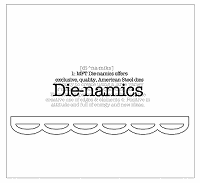 I love this sweet little alphabet and the banner die. Can't you just see all kinds of sentiments done with these? The sky's the limit! Finally, I finished it off with some baker's twine and buttons. Oh, and see the little snowflake separating the words? I borrowed that from Snowflake Flopsey. This card is also for the Crazy 4 Challenges challenge today. You can get all the deets at the C4C blog. Oct. 29 – ssnotime163 – Tis the Season for Clean and Simple – Clean and Simple is definitely the way to go when we need to mass produce. But it’s also a very refreshing and pleasing style to fall back on any time at all. Today let us truly think Clean and Simple – SUPER SIMPLE. 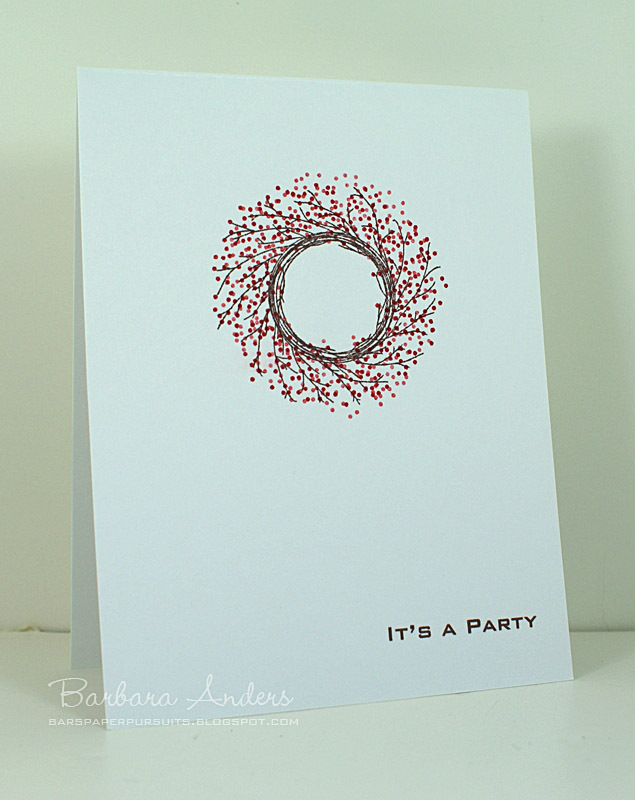 And let’s make cards with Christmas OR winter in mind as we inspire each other with all our Clean and Simple creations! OK, she got me at CAS but reeled me in at "mass produce". I don't normally like to mass produce, but I had decided to stamp my open house invitations this year, so the timing of this challenge couldn't be any more perfect! I've been making them on the computer and printing them off in previous years but I wanted to add that personal touch this year. But it had to be a quick personal touch, KWIM? So, now it's your turn. Come along and play and take us up on the challenge--we'd love to see what you come up with. If you do, be sure to leave the link to your project on Sharon's blog using Mr. Linky. Please use the keyword ssnotime163 if you upload to a public forum. 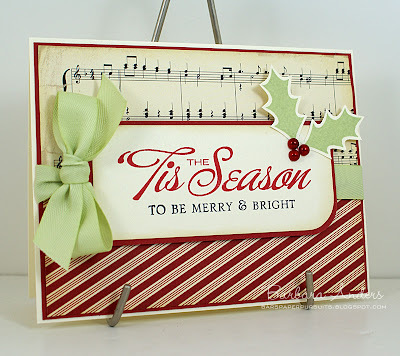 Don't forget to check out Sharon's fabulous sample and those of the design team, including our Guest Designer for October, Jerri Kay of A Touch Of Grace. 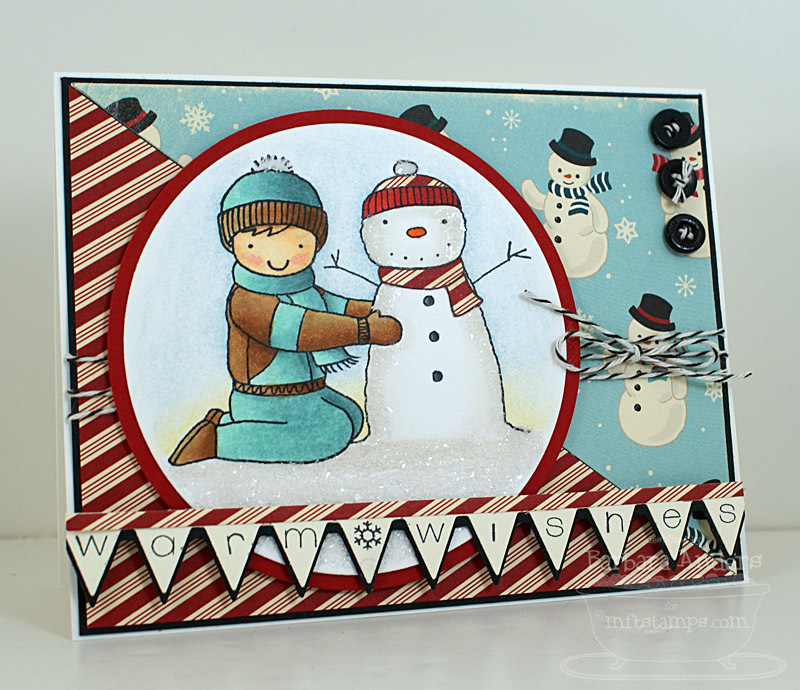 Here's the card that Chupa chose for this challenge--one of my very favorites from last year. And here's how I CASEd it. I changed the colors entirely, the sentiment and where it's placed, and used patterned paper. 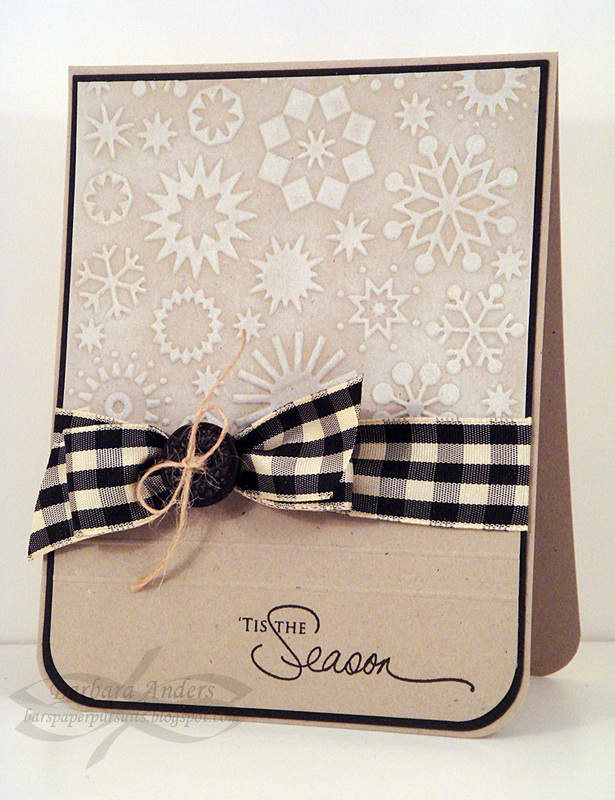 I kept the snowflake embossing but moved it down to the bottom. Thanks so much for stopping by! 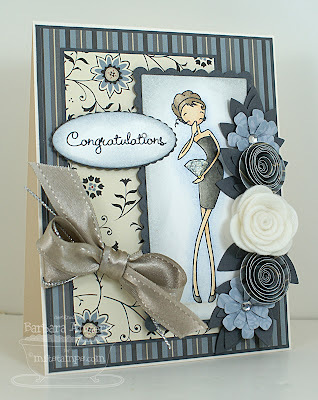 Be sure to check out what the fabulous CASE Study team did with my card! I know I'm not the only one who thinks time is just going too fast! It's already Wednesday again, so it's Color Throwdown time! This week, the sweet LeAnne is our hostess and she has chosen some colors that I love. Get all the deets at the CTD blog--we'd love to have you play along! Obviously, I chose to use these colors for a Christmas card, but you don't have to. I'd been wanting to ink up my new PTI Big and Bold Christmas Wishes set and this seemed like a good time to do it. You know I LOVE those sentiments as focal elements! Remember, you do not have to have the exact colors to play. If you don't, just use the closest you have. So, c'mon over to the Color Throwdown blog and play along with us this week. Please use the link service to post your card and please link directly to your card so we can find it easily. And please include a link in your post to the Color Throwdown. If you upload your card to a public forum, please use the keyword CTD116 so we can see your beauty all in one place. Hope to see you there! Be sure to check out what the other team members have come up with this week. It's time for Flourishes Timeless Tuesday Challenge (FTTC90)! It is the last Tuesday of the month so we have a guest challenge host. This month's guest is Linda Coughlin. Linda is challenging us to Anything Goes But Buttons and Bows There are so many wonderful embellishments to use for accents on our paper crafts, but all too often we fall back on our old favorites. 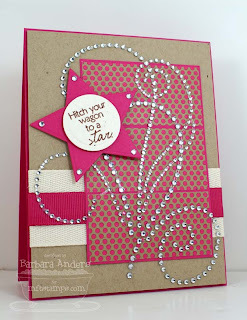 This week, let's stretch ourselves and see how creative we can be in embellishing our cards. We want to see what you can do without using buttons or bows. As you can imagine, this was HARD for me, LOL! What? No buttons and bows???? ACK!!! But, I soldiered on and this is what I came up with. Pretty simple, really. I stamped the cardinal image from Christmas Classics on Classic White card stock with Memento Tuxedo Black ink and colored it with Copic markers. 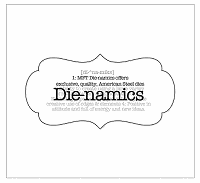 Then I cut it out/embossed it with a Classic Circle Nestabilities die, matting it with Riding Hood Red card stock. 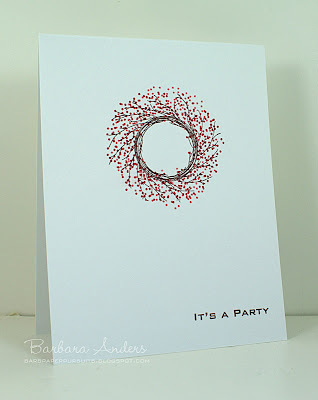 I embossed some white card stock about 2/3 of the way down with an embossing folder and stamped the sentiment in black, popped up the image and tied around some red and white baker's twine in a KNOT, not a bow :) All of that was matted with Kraft and then popped up on foam tape on the white base card. Now, be sure to go see how my team mates and our guest designer, Linda, worked this challenge! Howdy!! Today is Saturday so it's Crazy 4 Challenges time! Silke Ledlow continues to be our hostess and this week she wants us to make a Halloween card or project. Be sure to check out the C4C blog for all the deets. THEN, you know what to do--we'd love to have you come along and play with us. Just do your thing with the challenge and link it to Mr. Linky on the Crazy 4 Challenges blog. Please link directly to your project. And, if you upload to a public gallery, please use the key word C4C60. Thanks so much for dropping in today! Oct. 22 – ssnotime162 – Count your Blessings – We all have MUCH to be thankful for. And with Thanksgiving approaching we are reminded to Count Those Blessings!!! Today’s challenge is wide open, but it has an overall theme of THANKFULNESS. Some ideas that come to my mind – a thank you note, a small hostess gift, a project featuring our children, home, friends, etc. But the door is wide open – just create something that will in some way convey thanks for all our Blessings! And PLEASE, tell us what Blessings YOU are thankful for as you create your project! I hadn't had time to ink up PTI's Fall Jar Fillers so I got them out for this card. I'm in love with this line of stamps. I love old jars--and new ones, too. I use them for all kinds of storage. 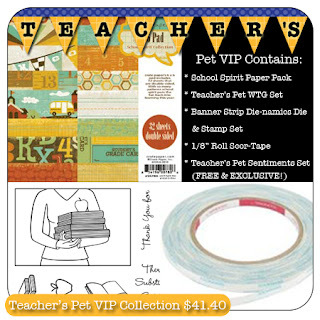 I stamped the images on MFT's Perfect Paper Panels and colored them with Copic markers. I paper pieced the lid cover and cut them both out and popped them up. The rest of the card is pretty simple: some of my fave Indian Summer paper from Basic Grey, twill, button, and twine (of course, LOL) and some stitching. The sentiment on the jar pretty much says what I'm thankful for. I'm thankful for all the wonderful people I've met through stamping--it's been an amazing journey so far and I hope to continue it for a long time to come. I'm also thankful for relatively good health, my family, my friends, and my job (although I'm counting the days to retirement ;-)). There are so many other things for which I'm thankful but they are the main ones. So, now it's your turn. Come along and play and take us up on the challenge--we'd love to see what you come up with. If you do, be sure to leave the link to your project on Sharon's blog using Mr. Linky. Please use the keyword ssnotime162 if you upload to a public forum. Don't forget to check out Sharon's fabulous sample and those of the design team, including our Guest Designer for October, Jerri Kay of A Touch Of Grace. And here is the CASE. I'm using the same layout, but everything else is different. 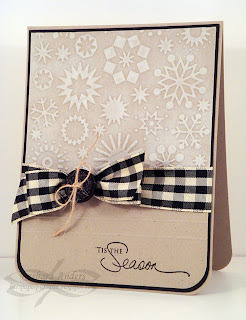 My patterned paper is PTI's Sugar Plum collection and the snowflake and sentiment are from Peace Be Still set--the snowflake was cut out with one of the Peace Be Still dies. Not much else to say about this card. Simple really, although that paper makes it look like there's a lot going on. Be sure to check out what all the CASE Study Design Team did with my card for inspiration, and we hope you'll play along with us! They are totally Halloween colors but I'm pretty much done with Halloween, so I played it safe with a birthday (or any other fabulous day) card. Cosmo Cricket's Pixilicious collection is perfect for these colors! For the Perfect Plum layer I stamped some images from PTI's Embellishments set randomly in Versamark. The a layer of patterned paper matted with Dusty Durango and finally this sentiment from Signature Greetings along with another image from Embellishements. Some ribbon and buttons to anchor the focal image finished it off! Remember, you do not have to have the exact colors to play. If you don't, just use the closest you have. So, c'mon over to the Color Throwdown blog and play along with us this week. Please use the link service to post your card and please link directly to your card so we can find it easily. And please include a link in your post to the Color Throwdown. If you upload your card to a public forum, please use the keyword CTD115 so we can see your beauty all in one place. Hope to see you there! Be sure to check out what the other team members have come up with this week. Awesome, or WHAT!? This set is so much fun! And don't forget that the two à la modes: It Must Be Love and What's Cooking?, that were previewed yesterday and today, will be fully released tonight, as well! SO much goodness in one place! I'm using the Crate Paper School Spirit paper on my project--it's just PERFECT, don't you think?? I stamped WTG on a Perfect Paper Panel with Memento Rich Cocoa ink and mostly paper pieced her, finishing up with some Copic coloring. I love that little grade card element--it's from a piece of the patterned paper :) With that amazing image and that great paper, not much more was needed. I did some distressing, some machine stitching, and some embellishing and it was done. I can see LOTS of uses for this new WTG, can't you? 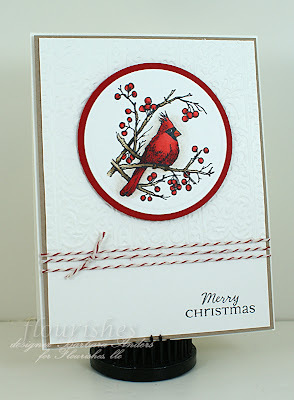 Other MFT products I used are Fossil and one of the newest additions, Blu Raspberrry cards stock. 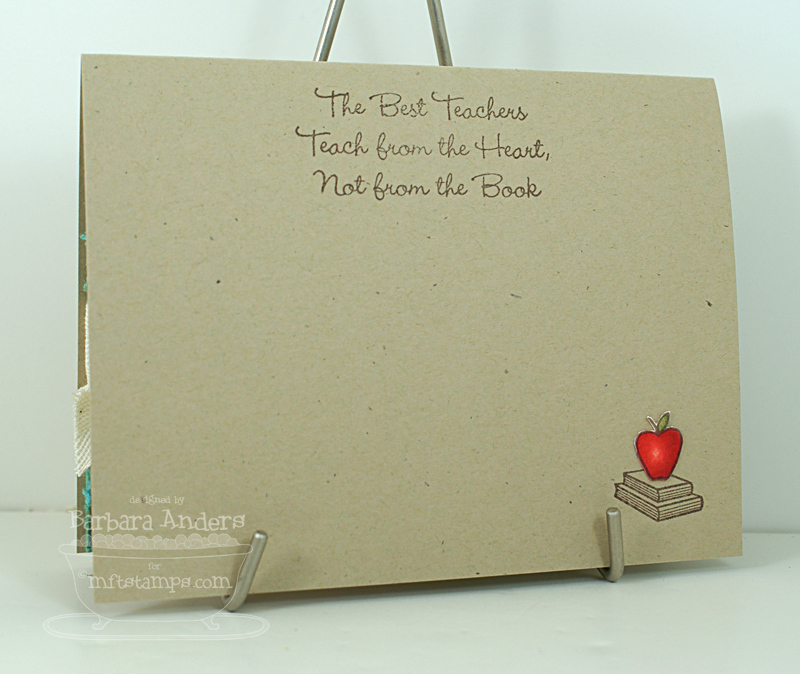 LOVE that little touch of red :) All of the sentiments on my card are from the Teacher's Pet Sentiments mini set, and Teacher's Pet has some fabulous sentiments, too. Now, you'll want to head on over to the amazing Melody's blog to see what she has on the books for you (I know, GROAN!). à la modes - What's Cooking? Each set is produced in the USA using the highest quality rubber, with the deepest etch possible. Each image and sentiment is backed on cling foam and scroll cut, making it ready for stamping right out of the bag! Packaged in a clear hang bag, we've also provided the ideal storage solution by including a thick laminated header card in each set that can be used to store the stamp set, in its entirety, after purchase. $10.95 for the 3 x 4" set. I just love how sassy this line of stamps is! This little lady was colored with Copic markers and matted with Fossil card stock. I'm using Jen del Muro's SFYTT for this week but I changed it up just a wee bit. I'm not a big fan of square cards so I made it A2 size instead, but I think all the elements are there. 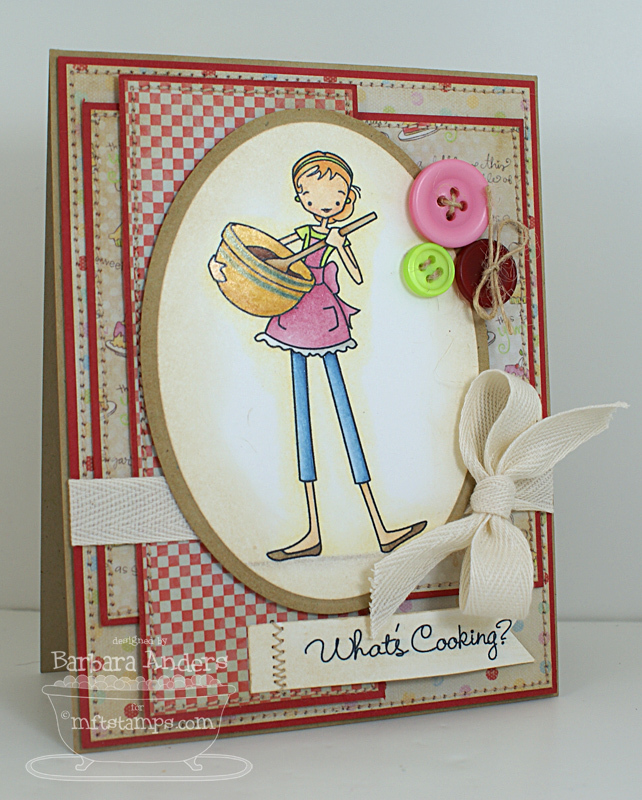 I've just about covered up the sweet Melissa Frances Kitschy Kitchen paper that I used for this card. 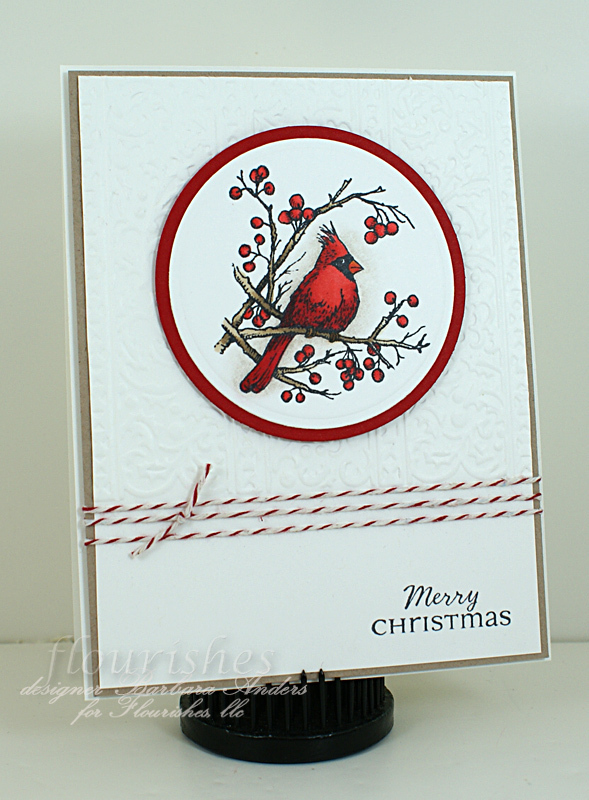 Other MFT products I used are Wild Cherry card stock and Earth Girl and Summer button collections. To see more of this sweetie from the Creative Team, be sure to hop on over to Kim's blog after 11:00am today--she'll have a list for you. It is time for Flourishes Timeless Tuesday Challenge (FTTC89)! Maki Jones is the challenge host this week. Maki is challenging us to focus on the sentiment. 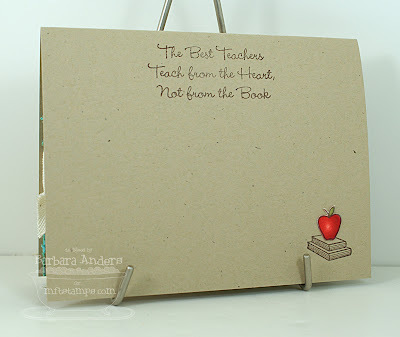 Create a card or project with the sentiment as the main focus. We would love to see what you create. I'm all over this one. 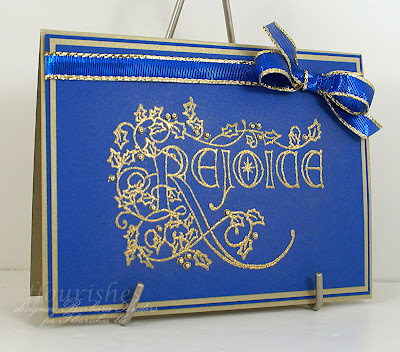 LOVE sentiments as the focal image and I couldn't wait to use this old favorite: Rejoice. I really LOVE this image. 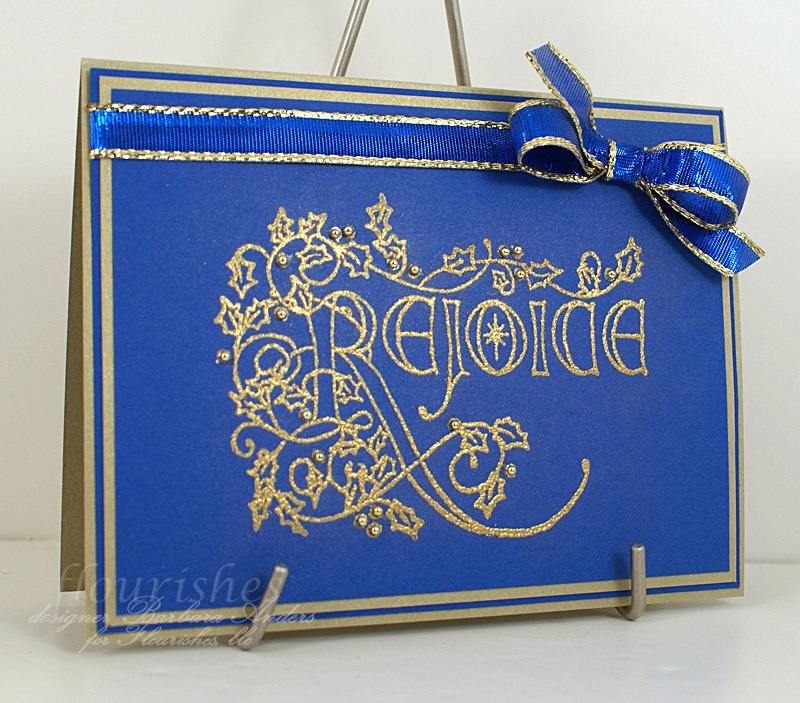 I stamped it on Brilliant Blue with Encore Gold Metallic ink and heat embossed with gold fine detail embossing powder. Then I just layered it up with some gold metallic card stock. So simple, but this image doesn't need a lot to make it shine. The only other thing I did was to tie that gorgeous ribbon around in a bow and add some flat backed gold beads to the holly berries, just to add a little dimension. 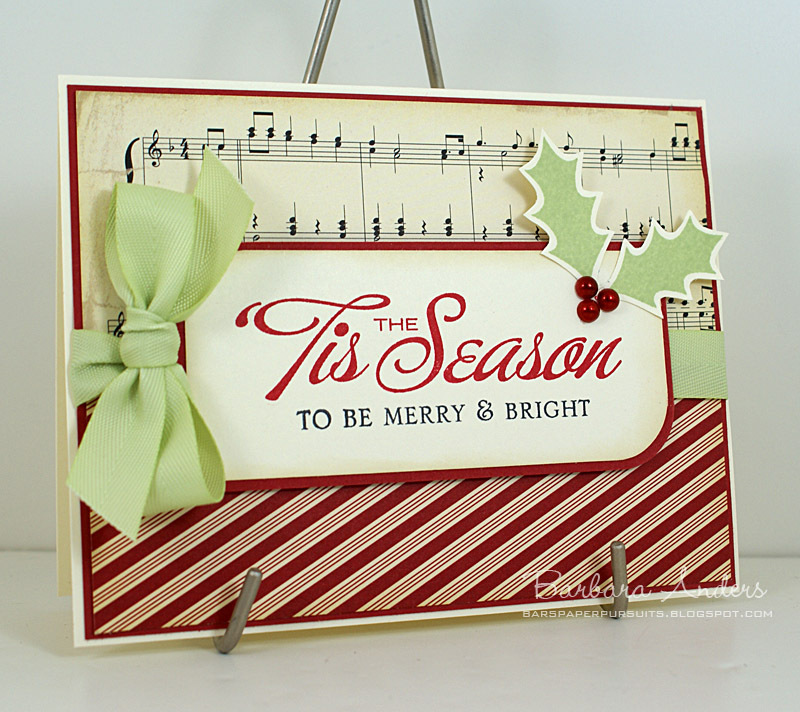 Now, be sure to go see how my team mates used sentiments as their focal image! OK, so here's my card. today I have à la modes in It Must be Love. Oo la la, right? Look at that rock! I decided that she looked quite formal in that dress so I went with a formal design. I colored her with Copic markers and added some bling to "the rock" with a Sakura glitter pen. And when a girl gets engaged, flowers are also in order, right? 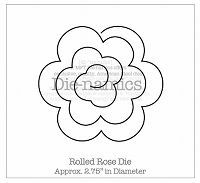 So I gave her a bouquet - all cut out with Die-namics dies: Rolled Flower, Rolled Rose, and Flower Trio and Leaf Trio. To see more samples from the Creative Team, be sure to pop unto Kim's blog after 11am this morning to see the complete list. Hello, everyone! Are you ready for another Crazy Girls challenge? 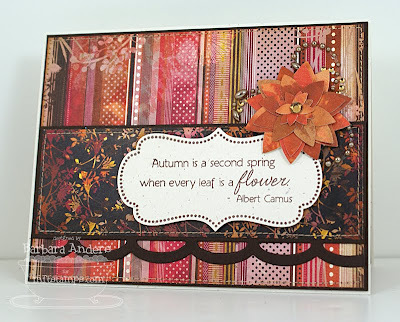 Today the amazing Silke is challenging us to make a fall card. I can SO do that, LOL! 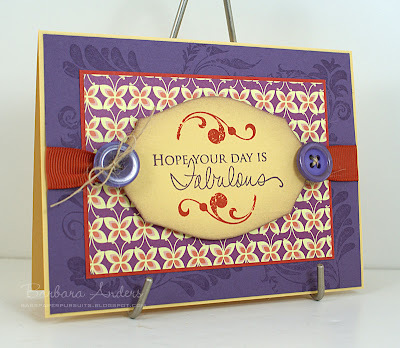 I'm using MFT's Framed Greetings set and die and the sentiment is from Clearly Sentimental About Harvesting. I so love that quote. And it's so true. 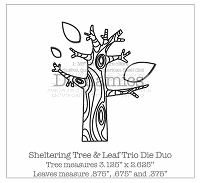 I decided to use the quote as my theme and literally create a flower from leaves--leaves die cut with MFT's Sheltering Tree Die-namics set (temporarily unavailable). 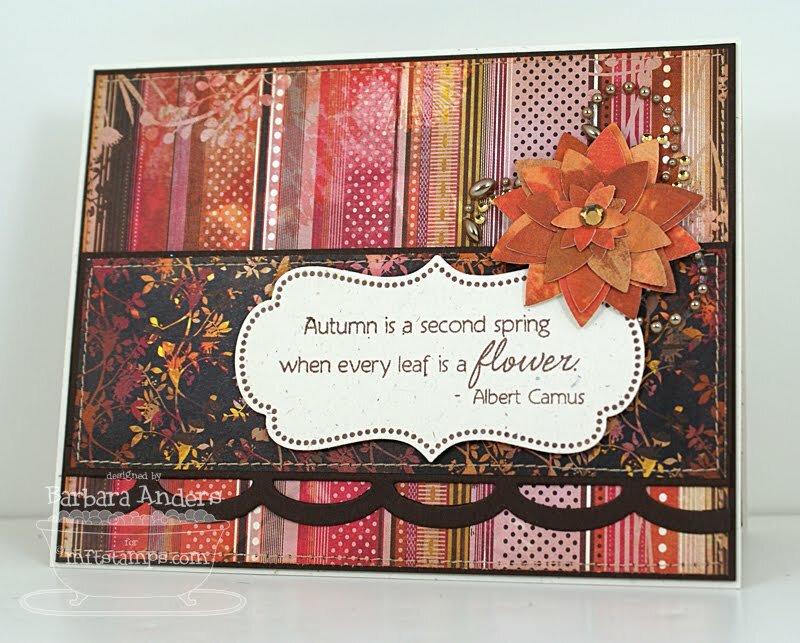 I cut the leaves from my favorite fall patterned paper, Basic Grey's Indian Summer, and created a flower by overlapping and layering the leaves. I kinda like how it turned out. I adhered it on top of some swirly bling and added a yellow rhinestone to the center. 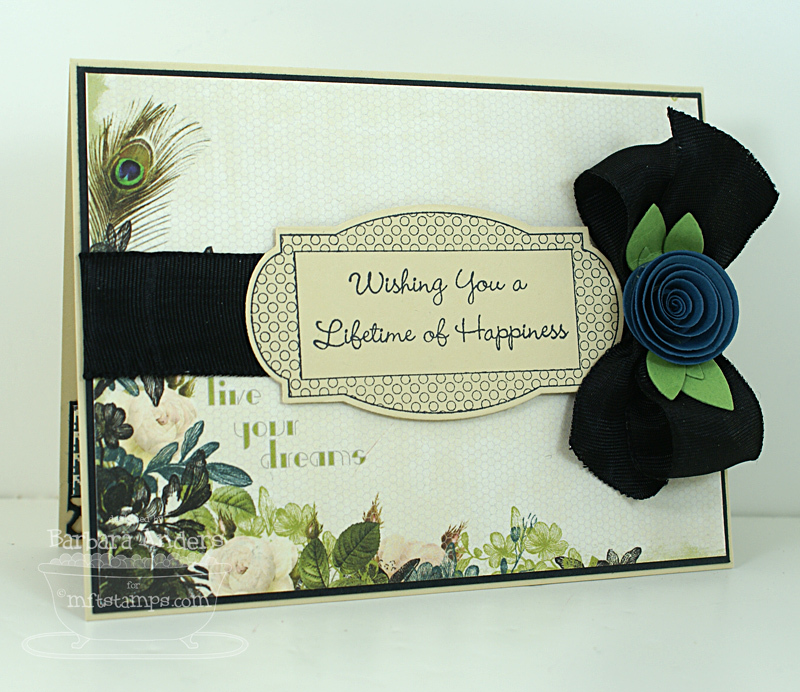 The border was done using MFT's Open Scallop Border Die-namics die. Here's the inside with another sentiment from Clearly Sentimental About Harvest. THEN, you know what to do--we'd love to have you come along and play with us. Just do your thing with the challenge and link it to Mr. Linky on the Crazy 4 Challenges blog. Please link directly to your project. And, if you upload to a public gallery, please use the key word C4C59. I'm a CASE Study Muse!! MFT October Blog Hop and Shop! !